Kraftig LED lampe der er god til facadebelysning. Kan bruges udendørs dan den er IP-65. Benytter high-power dioder, der er væsentlig kraftigere end tidligere teknologi. The Cameleon Bar 12/3 is designed for indoor and outdoor use where a small bar is needed with a bright output such as wall wash, truss projection & fashion show runway lighting. This fixture is extremely bright with perfect color mixing and wall wash effects. 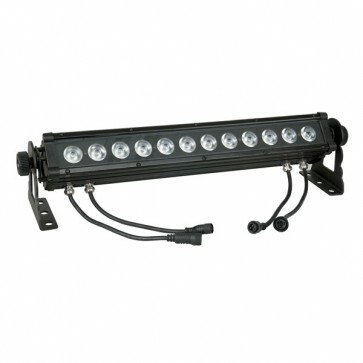 The LED bar is easy to install and can be used in any application.